Gun control: Colorado state Sen. Evie Hudak resigns. A state lawmaker who voted for gun control faced quick comeuppance. A Colorado state senator unexpectedly announced her resignation Wednesday after facing the threat of a recall election organized by gun rights activists. State Sen. Evie Hudak is resigning in order for the legislature to maintain its Democratic majority. Gun control is an especially fraught issue in Colorado, where two of the worst mass shootings in the past 15 years occurred. Earlier this year, Democrats in the state legislature passed a spate of gun control bills, for which two Democratic lawmakers have already faced recall elections and been kicked out of office. Hudak: Thank you for sharing your story. Very, very unsettling story. I just want to say that actually, statistics are not on your side, even if you had had a gun. You said that you are a martial arts student and yet—I mean person experienced in tae kwon do—and yet because this individual was so large, was able to overcome you even with your skills. And chances are that if you had had a gun, then he would have been able to get that from you and possibly use it against you. 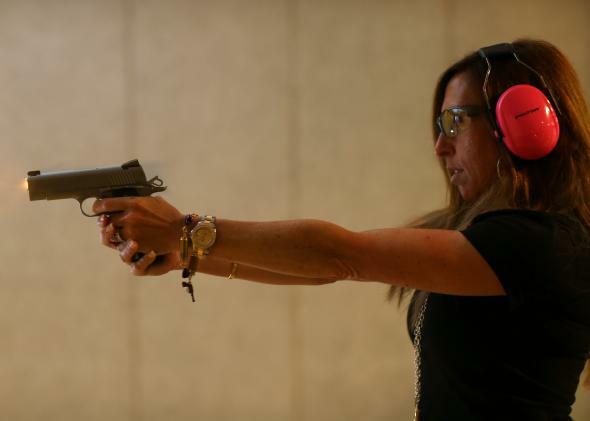 The Colorado Coalition Against Gun Violence says that for every one woman who used a handgun to kill someone in self-defense, 83 were murdered by them. Collins: Respectfully, Senator, you weren’t there. Most Coloradans believe that going through a background check is a reasonable thing to do if it means we can keep guns out of the hands of violent criminals. Most Coloradans believe that the convenience of high-capacity magazines is less important than saving lives in tragedies like Sandy Hook, Aurora, and Columbine. Most Coloradans believe that people under restraining orders for domestic abuse should not be able to endanger those around them by keeping their guns. That’s why I sponsored SB 13-197, a bill that takes guns out of the hands of domestic abusers and will save the lives of many women caught in abusive relationships. I am proud of what has been accomplished over the last year, and I believe these bills will make life better for all the people of my district and for all Coloradans. By resigning, I am protecting these important new laws for the good of Colorado and ensuring that we can continue looking forward. There’s a weird symmetry between these recalls and Wisconsin’s smorgasbord of recall elections from 2011—first two Republican state senators were recalled, then a third recall target, state Sen. Pam Galloway, resigned citing family issues.